I see many healthcare providers in my chiropractic office, including nurses who work eight- to 12-hour shifts. Nurses spend their days walking or standing on a hard surface that wreaks havoc on their feet as well as their knees, hips and back. Heel pain, plantar fasciitis, shin splints, knee pain, hip pain, low back pain and many other aches and pains are quite common among this hard-working group. One of the best ways to give your poor tired and sore body a little relief is to choose the best shoes you can to support you from the foundation up while at work. Selecting the right pair of shoes can be overwhelming given all the high-tech shoes available, the in-your-face marketing strategies employed by big shoe companies and all the bells and whistles that are listed in every shoe description. For many people, the choice of footwear is all too often based on factors such as how much they cost, how pretty they are or even which celebrity has endorsed them. Many will go straight to the bargain table and look for the least expensive shoe that fits them, and off they go. Conversely, some will assume that the most expensive shoe in the store is the best one. Your choice of work shoes can make the difference between having a good or bad experience, working in comfort or pain and, most importantly, whether you stay healthy or get injured. There really is no single “best shoe,” as everyone has slightly different needs. These options are essentially categorized by your biomechanical needs. Are you injured or have you been injured in the past year? Pronation (rolling in): Pronation is normal and necessary for each step. It’s the action of the foot rolling in such that it can absorb the weight of your body with each step. Supination (rolling out): Supination is also normal and necessary for each step. It’s the action of the foot rolling back out to line up the bones of the arch of the foot and form the rigid lever that helps you to move forward. Biomechanical problems begin when a foot rolls in too much (over-pronation) or rolls out too much (under-pronation). Most people who have aches and pains in their feet or legs will have feet that roll in too much (over-pronate). One method of determining your level of foot pronation and, ultimately, foot and gait type is by checking your arch height. The easiest way to get a general idea of your arch is by using the “Wet Test.” Look at the outline that your wet foot makes on the floor or the bath mat when you get out of the shower. People tend to assume that if their feet or knees are hurting, they should have more cushioning at their feet. This is actually the opposite of what they need. Most of these people have feet that roll in too much (over-pronation). So instead of adding more cushioning, stabilizing the foot with a very supportive shoe will offer much-needed relief. The more you weigh, the more force you will generate each time you put your body weight over your foot. Consequently, a heavier person needs a shoe that offers both cushioning for shock absorption and stability for added durability. If you’re currently injured or have ongoing pain in your feet, legs, hips or back, or if you’ve struggled with injury in the past year (and especially in the last three to six months), then you will need more support at your feet until you can get past your injury and get healthy and strong again. Despite what you have learned here so far, it’s still a good idea to go to a specialty store to purchase your new shoes. The people who work in these stores are knowledgeable and will guide you in making the best choice for your foot. If you have a particularly “special” foot or if you have struggled with finding the right shoe even with the advice of a specialty store, then consider seeing a health professional who has some expertise in this area. See a healthcare provider who has a lot of experience working with feet and offering advice in shoe selection. When is it time to get new shoes? 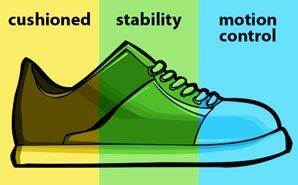 Shoes should be changed every 500 miles or 800 kilometers. For a healthcare professional working 40 hours per week on her feet, this equates to about a couple of times a year (every six months). Those who are heavier or who are struggling with pain or injury might need to change their shoes even more often (every three or four months). When a patient comes to my office with a new symptom such as knee pain, shin splints, heel pain, hip pain or back pain, one of the first things I ask about is the age and mileage of their shoes. Since shoes can appear to be in good condition but fail to provide adequate support, this is often a reason for a new injury. For those with biomechanical challenges such as excessive pronation, severe bunions or a leg length discrepancy, a good shoe may not be enough and a custom orthotic insert may be recommended. Orthotics can help correct the biomechanics of muscles in the lower leg and foot to help stabilize the foot and restore normal function to both your feet and to all the structures above your feet. Talk to your healthcare provider about the best options for your feet. Dr. Peggy Malone is a chiropractor and an athlete who helps other athletes to overcome injury and get back to their sport. She also inspires patients from all walks of life to take control of their health to be as happy and healthy as they can be. Read more about her adventures and get some great information on health and wellness on her website.